The Oak Island Lighthouse and Coast Guard station have a long history together, and the tall lighthouse tower stands as a welcoming beacon to visitors who head to these picturesque shores. As the newest lighthouse in North Carolina, the distinctive white, gray and black structure is unlike any other on the coastline, prompting both curiosity and amazement from visitors, and making it a "must-see" on any lighthouse lover's road trip list. 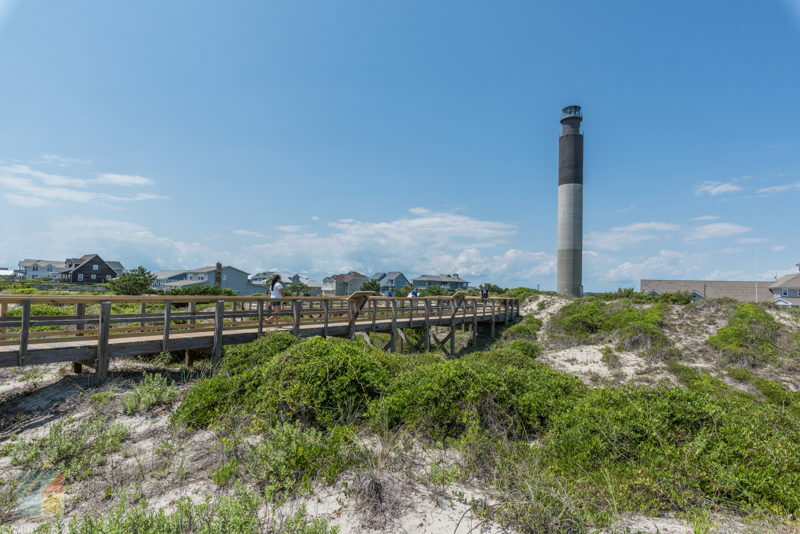 The lighthouse was built in 1958 in an effort to assist the neighboring Bald Head Island lighthouse in guarding the mouth of the Cape Fear River for mariners passing through, as well as the Atlantic Ocean coastline. Because both Bald Head Island and Oak Island are dangerously close to the Frying Pan Shoals, as well as the channel that runs up the river from the ocean to the port town of Wilmington, it was determined that two structures were needed to guard this large region of waterfront. The Bald Head Island lighthouse guarded the western portion, specifically the Cape Fear Riverbanks, while the Oak Island lighthouse would be a beacon for ocean traffic that was travelling offshore. The lighthouse was built on the expansive site of the local Oak Island Coast Guard station ,which has been active since 1932, and which was an original Lifesaving Station before that. Because the Oak Island Lighthouse is the newest structure in the state, and therefore has the benefit of more modern technology, it is also one of the coast's hardiest, strongest and most effective lighthouses.Before the tower itself was even built, 24 concrete pilings were driven into the ground nearly 70' feet deep to protect the structure from storm surges or floods, and the long tapered structure is also a marvel itself, with solid, 8-inch-thick concrete walls throughout. The distinctive pattern of the three solid black, gray and white stripes was also due to its initial construction, as each colored component of the tower is created with a different material. The first 40' feet of the tower is comprised of natural gray cement, while the next 50' feet is made up of white Portland cement and white quartz aggregate, and the final top portion is composed of cement and black paint. As a result, the tower will never have to be repainted, and has a unique color-blocking exterior that sets it apart from its coastal neighbors. The completed tower itself is 148' feet tall, with an 11' foot tall lantern room which holds 8 aero beacon lighting fixtures, with 4 on top and 4 on the bottom. When the lighthouse was first lit with the original carbon-arc mercury lamps in 36" reflectors, it was one of the brightest lights in the world. By the end of the century, however, the modern navigational systems that were standard with passing ships made the lighthouse obsolete, and the Oak Island Lighthouse was briefly turned off and abandoned, and designated as a government "surplus property" in 2003. In 2004, the town of Caswell Beach was granted ownership of the lighthouse and bordering oceanfront property by the Federal Government, and today the lighthouse remains open to the public so that visitors from all over the country have an opportunity to explore this unique structure. Tours are available to the second level of the structure during the summer months, specifically Memorial Day through Labor Day, on Wednesdays and Saturdays from 10:00 a.m. until 2:00 p.m. Adventurous climbers also have the option to climb to the top year-round, however, reservations for this hike must be made in advance at least two weeks before a proposed visit. Once of the first things that lighthouse fans will notice during their climb are the unique stairs, which aren't spiral in nature like the other North Carolina lighthouses, but are more similar to "ship's stairs" with straight staircases going in opposite directions. The seasonal standard tour takes visitors up 12 steps to a landing, while the full climb will allow hikers to climb up all 131 steps to the top to enjoy unparalleled views of the island surroundings. Visitors any time of year can always catch a few fantastic photos of the lighthouse via a boardwalk and an observation deck just across the street that provides an excellent view of the structure. The grounds are open from sunrise until sunset, and parking is limited to 30 minutes per visitors, but this allotment is plenty of time to snap a few photos and look up in awe at the towering lighthouse overhead. Potential lighthouse climbers can request a tour by contacting the Oak Island Lighthouse directly at oakislandlighthouse@gmail.com, or by filling out an online form, located on their website. The Coast Guard Station, which borders the lighthouse, has a unique history all its own. An established site for decades, the former Coast Guard Station burned to the ground in 2002, and was quickly replaced with an almost exact replica of the former station. An instrumental lifesaver for maritime traffic that runs into trouble along the Cape Fear River or offshore of the Southern North Carolina coastline, the station has a long history of keeping the waters of Oak Island safe for all visitors. Both the Oak Island Lighthouse and the Coast Guard Station are relatively new, but cherished local landmarks in this small island community. The lighthouse, with a distinctive look and an equally original light that flashes briefly four times every 10 seconds, is considered a signature of the community, and many local tees, souvenirs, and other trinkets pay homage to this distinguished structure. Open to visitors for photos year round, and a fantastic icon for lighthouse and coastal lovers alike, the Oak Island Lighthouse and adjacent Coast Guard Station easily combine to create one of the most favorite local landscapes off the beach. Where is the Oak Island Lighthouse? The Oak Island Lighthouse is located on the eastern edge of Oak Island, along Caswell Beach Road. When was the Oak Island Lighthouse built? The Oak Island Lighthouse was built in 1957, and first lit in 1958, making it one of the newest lighthouses along the North Carolina coastline. How many steps are in the Oak Island Lighthouse? There is actually no spiral staircase or traditional steps for the Oak Island Lighthouse, but there is a series of ship ladders with a total of 131 steps. How tall is the Oak Island Lighthouse? The height of the Oak Island Lighthouse is 169 feet as it stands on a slightly elevated site. However, the structure itself is actually 135 feet tall. Why does the Oak Island Lighthouse have three colors blocks? The three color blocks are actually because of the individual mixtures of the concrete that were used to build the lighthouse. The first 40 feet of the Oak Island Lighthouse is a natural gray color that stems from the Portland cement. The next 50 feet was constructed with white Portland cement and white quartz aggregate, forming the white color, while the top 53 feet of the lighthouse was created with a gray Portland cement with black coloring. How do you get to the Oak Island Lighthouse? 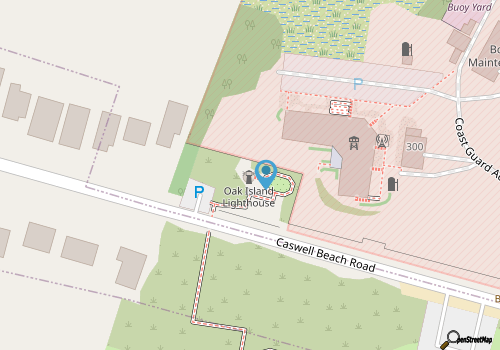 Visitors to Oak Island can easily reach the Oak Island Lighthouse by heading east on Caswell Beach Road. The structure, which extends 169 feet into the air, stands out in a relatively undeveloped area that is adjacent to the U.S. Coast Guard Station. Can you climb the Oak Island Lighthouse? Visitors can climb the Oak Island Lighthouse, either to the second level, or all the way to the top via a private tour, which must be scheduled in advance. When can you climb the Oak Island Lighthouse? Tours to the second level of the Oak Island Lighthouse are available in the summer months on Tuesdays, Thursdays, and occasional Sundays in the mornings. Tours in the off-season, as well as tours to the very top of the lighthouse, can be scheduled in advance by emailing oakislandlighthouse@gmail.com. Phone reservations are not permitted. Can you climb the Oak Island Lighthouse if it’s raining? Visitors can climb the Oak Island Lighthouse if it’s raining, however, the lighthouse may close due to severe weather events, such as hurricanes or thunderstorms in the immediate area. How old do you have to be to climb the Oak Island Lighthouse? All climbers to the top of the lighthouse must be at least 9-years-old, and children under the age of 16 must be accompanied by an adult. 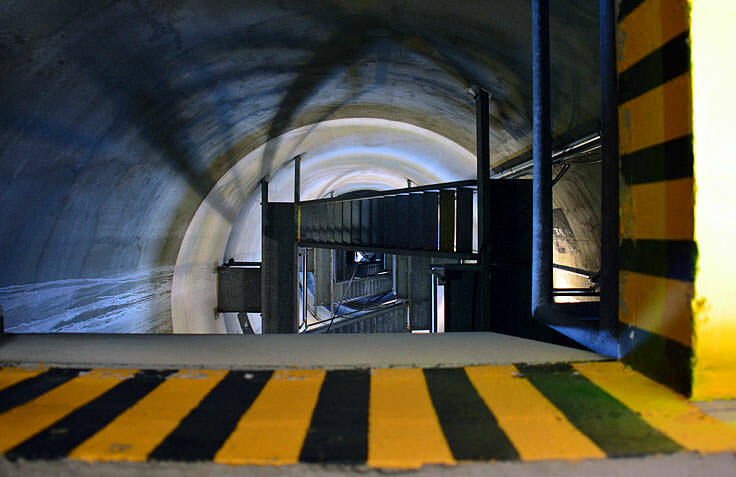 Visitors of all ages can climb to the second level of the lighthouse. Does it cost money to climb the Oak Island Lighthouse? There is no fee to climb the Oak Island Lighthouse. Visitors who want to climb to the top, however, will need to reserve a private tour, and should request a reservation at least 2-4 weeks from the dates of their stay. Why is the Oak Island Lighthouse important? The Oak Island Lighthouse is unique in that it is one of the few lighthouses along the North Carolina coastline that was built in the latter 20th century. It is also one of the only all-concrete and perfectly cylindrical lighthouses guarding the coast, and its three blocks of color is distinctive among the North Carolina lighthouses. Who owns the Oak Island Lighthouse? 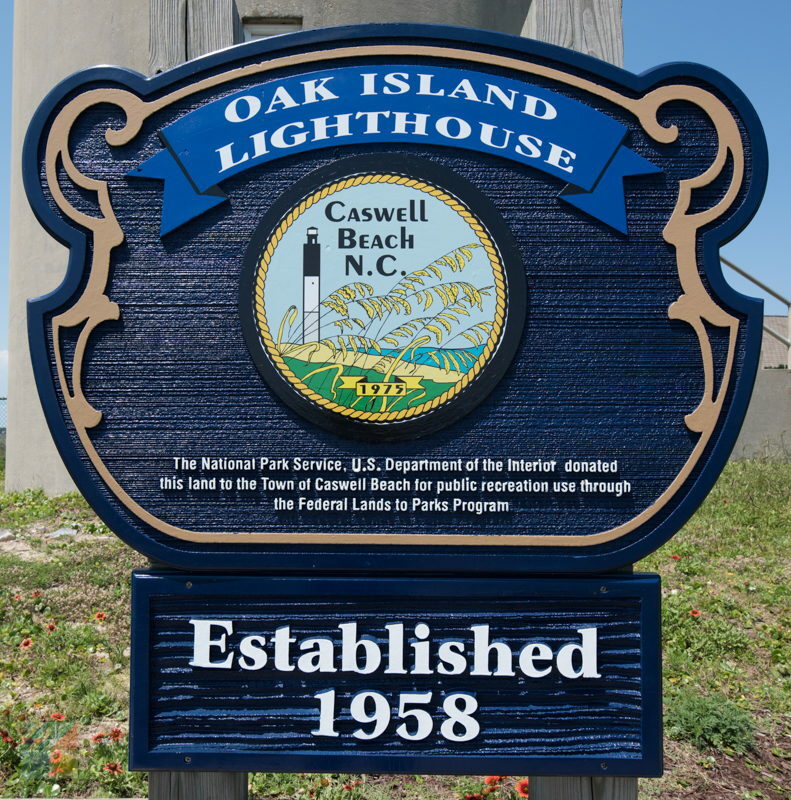 The Oak Island Lighthouse is owned by the Town of Caswell Beach, however, all tours, governance and maintenance projects are run by a local organization, the Friends of Oak Island Lighthouse, which was created by the town. 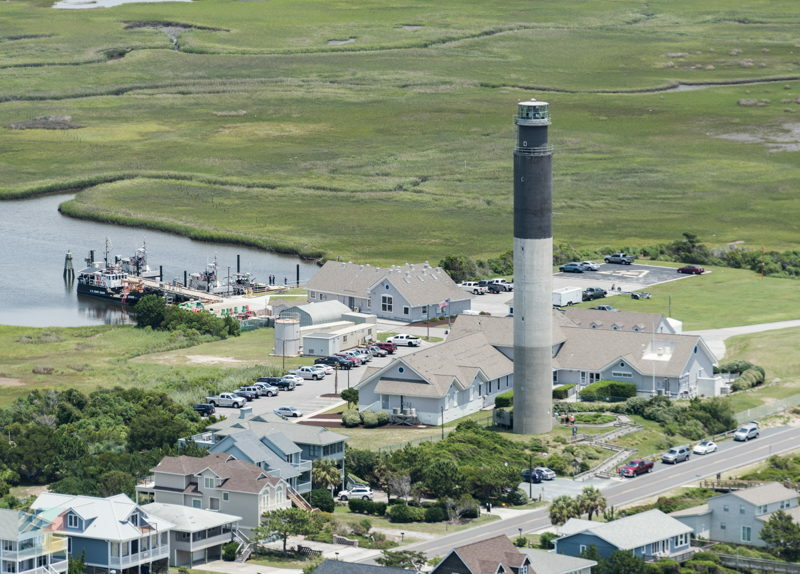 Where can you stay near the Oak Island Lighthouse? The community of Caswell Beach and Oak Island have a number of vacation rental homes that can accommodate guests for multiple-day stays. 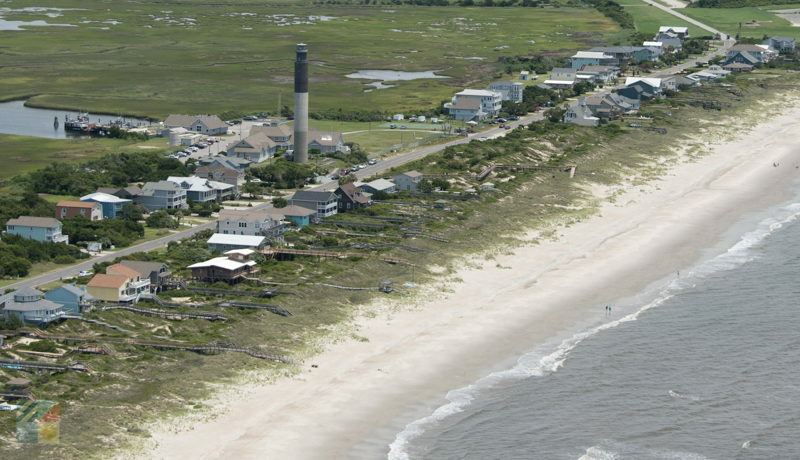 In addition, the area has several hotels and motels that are close to the Oak Island Lighthouse. Do I need reservations to climb the Oak Island Lighthouse? 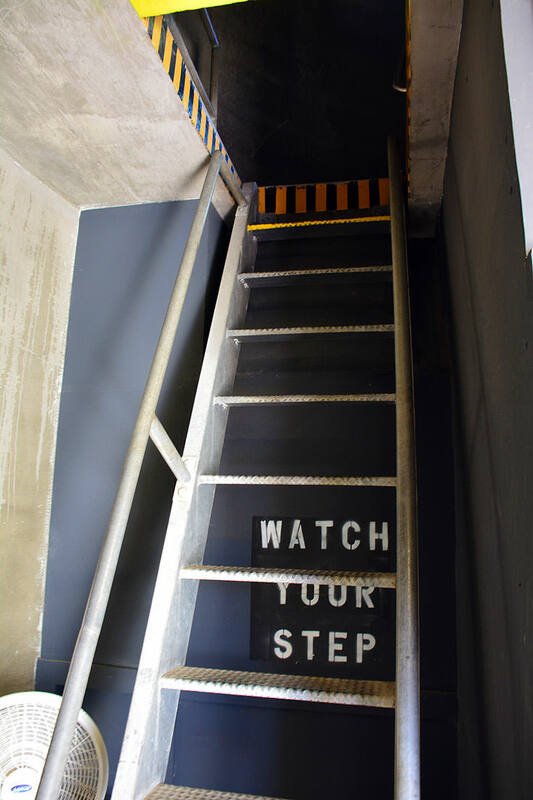 While the second level of the lighthouse is generally open to the public for several days a week in the summer months, visitors do need to book a reservation, or private appointment, to climb the 131 ladder-style stairs to the top. Reservations should be made at least 2-4 weeks before requested tour date, and tours can be arranged by emailing oakislandlighthouse@gmail.com. Is the Oak Island Lighthouse lit? The Oak Island Lighthouse is lit nightly with four 2.5 million candlepower aerobeacon lenses. How often is the light rotation at the Oak Island Lighthouse? The four aerobeacon lenses of the Oak Island Lighthouse produce four, one-second bursts of light every 10 seconds. How far away can you see the Oak Island Lighthouse light? The Oak Island Lighthouse has a wide range, and can be viewed up to 24 nautical miles away on the ocean, and up to 16 nautical miles away on land. What kind of light does the Oak Island Lighthouse have? The Oak Island Lighthouse has one of the newest light fixtures along the North Carolina coastline, which comprises of four 2.5 million candlepower aerobeacon lenses. Is there an Oak Island Lighthouse museum? There is no Oak Island Lighthouse Museum at the site. Where can you eat near the Oak Island Lighthouse? The town of Caswell Beach and the Oak Island area have a number of restaurants that are within a few miles of the Oak Island Lighthouse. Does the Oak Island Lighthouse have a gift shop? There is no gift shop for the Oak Island Lighthouse. Are there any restrooms at the Oak Island Lighthouse? There are no restrooms available at the site of the Oak Island Lighthouse. What are the attractions near the Oak Island Lighthouse? 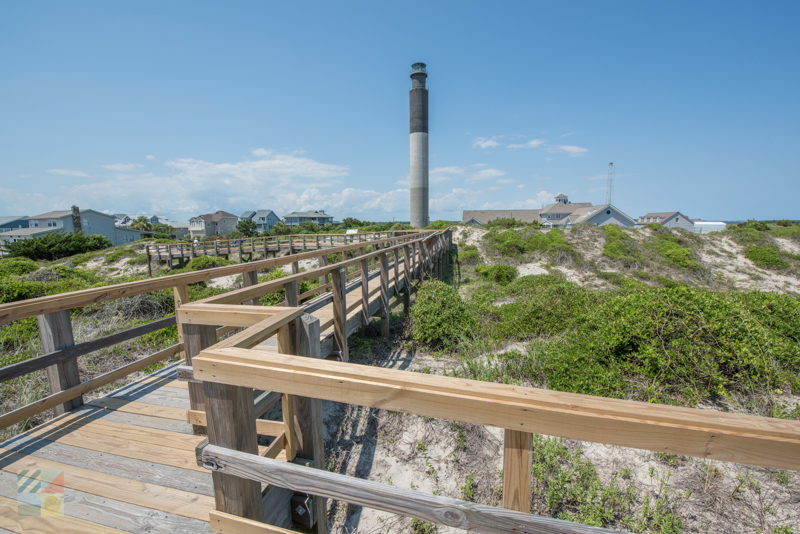 The Oak Island Lighthouse is relatively close to the Oak Island Pier, the famed North Carolina Baptist Assembly at Fort Caswell, and is a shell’s throw away from miles of beautiful beaches. Where can you park to visit the Oak Island Lighthouse? There is limited parking available near the base of the Oak Island Lighthouse. Because only a few spaces are available, parking is limited to 30 minutes. Is it safe to climb the Oak Island Lighthouse? The Oak Island Lighthouse is safe to climb via a guided and private tour, however, visitors should note that the ship ladder steps are very steep. All visitors must wear sneakers to climb to the top on a special reserved tour, and all climbers must be at least 9-years-old. Tours to the second level, however, (which also do not require a reservation), can accommodate visitors of all ages, and all kinds of footwear. Can you take photos of the Oak Island Lighthouse? Visitors are free to take photos and videos of the Oak Island Lighthouse, but should note that parking is limited to 30 minutes. When was the Oak Island Lighthouse fire? In February of 2002, a fire broke out at the Oak Island U.S. Coast Guard Station, which is next to the Oak Island Lighthouse. Although the sites are adjacent, the lighthouse suffered no damage from the fire, even though the station burned to the ground and had to be rebuilt.